St. D'vencE 100% organic and virgin coconut oil is an all-natural carrier oil that readily absorbs into your skin, making it an ideal oil for all skin and hair types. Being a cold pressed natural oil, it ensures all vital nutrients penetrate into the skin and scalp providing effective results. This light weighted oil is easily absorbed and will not clog pores, promoting clear, soft and healthy skin. 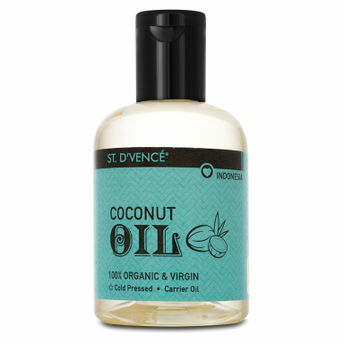 It nourishes your scalp and promotes hair growth and repairs dull, frizzy hair preventing spilt ends and hair fall. It blends seamlessly with essential oils or any mix ins. Create your own DIY scrub, mask or aromatherapy solution with this versatile oil. It is is rich in ethically sourced ingredients which come with a host of skin, hair and health benefits. It works excellent as a skin nourishment and can be used as a face and body moisturiser as well. A great source of anti-oxidants, it is ideal for healing skin damages.